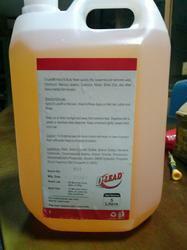 Providing you the best range of d- lead hand & body wash for industrial purpose with effective & timely delivery. 5 Ltr. Can - Quickly and efficiently removes lead, heavy metal dusts and contaminants from the skin and hands. The mild formula with skin conditioning solution is designed for frequent cleaning. Fast acting and economical D-Lead® Hand & Body Wash Solution is the hand and skin care solution for cleanup anywhere rinse water is available. Looking for new product ?